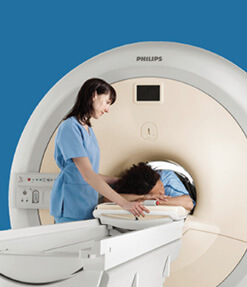 STAR imaging and research centre was started with a dream of providing worldclass diagnostic facilities to one and all. The latest and high end machines are backed by an equally competent team of radiologists with speciality imaging as the most unique feature which is how founder and director Dr. Ashish Atre had envisioned it. Recent installation of premium 128 Slice Ingenuity CT at STAR Imaging centre is an important milestone in realizing our mission with improved diagnostic results at markedly reduced and lowest possible radiation exposure. Philips unique Adaptive multi cycle reconstruction algorithm achieves temporal resolutions as fast as 53 milliseconds which leads to excellent quality images with faster acquisition times. 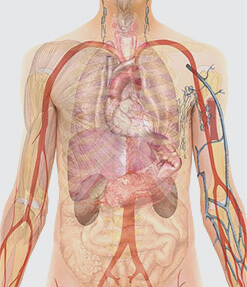 These features put us at an advantage for imaging the vascular system from head to toe and also in paediatric cardiac CT studies. 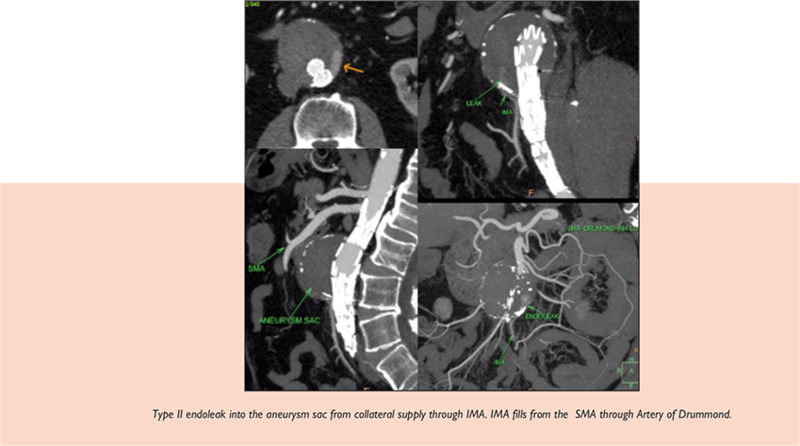 History of abdominal aorta aneurysm on regular USG follow up. 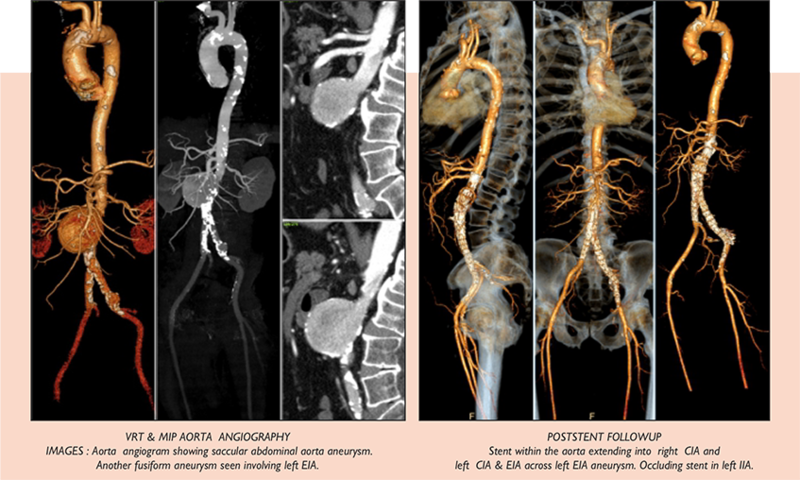 Pre and posttreatment aorta angiography imaging. 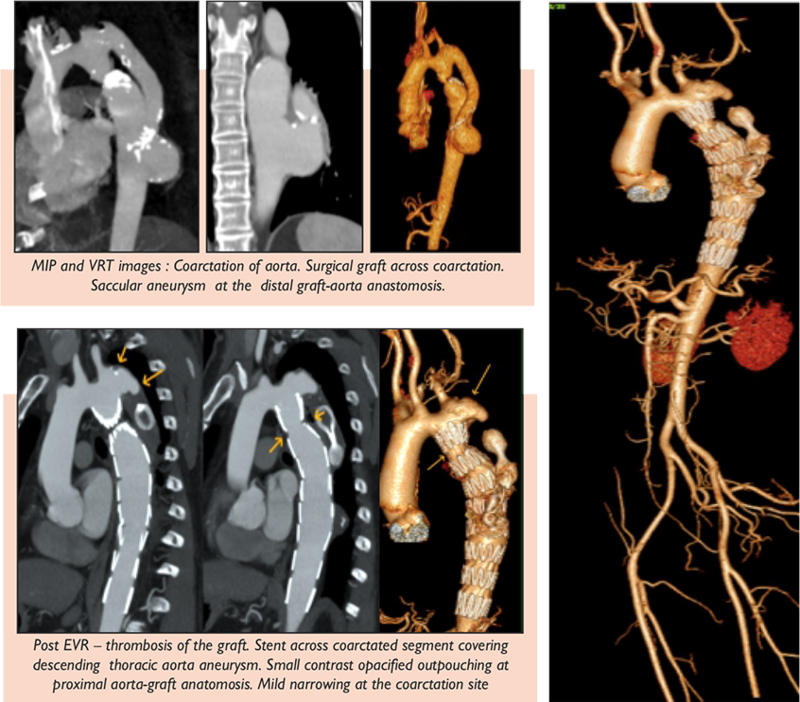 Coarctation of aorta treated with surgical grafting. Now presented with hemoptysis. 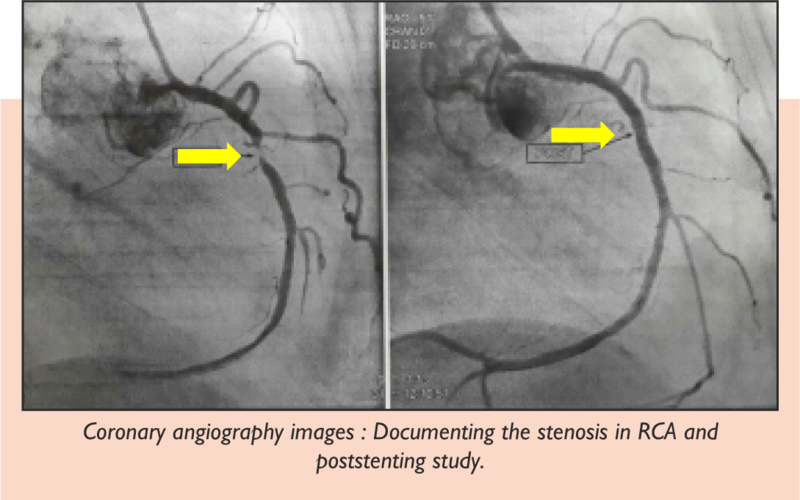 Diagnostic Thoracic aorta angiography was done followed by endovascular repair. 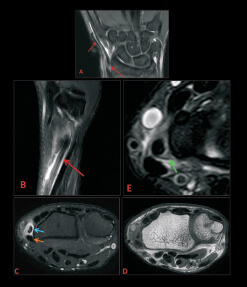 Follow up imaging. 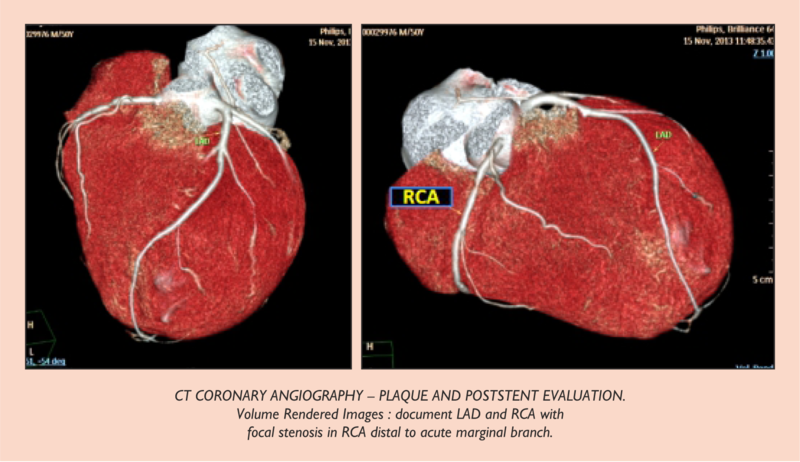 • CT aorta angiography study allows optimal evaluation of aorta with respect to course, caliber, plaque evaluation, involvement of branch vessel origin, distal vessel. Simultaneous evaluation of end organ has an additive role. 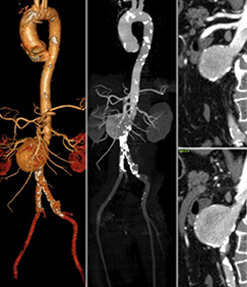 • Post endovascular / surgical repair assessment is an important area where CT provides 3D anatomy, isnoninvasive and successfully evaluates all associated complications within and outside the vascular lumen. 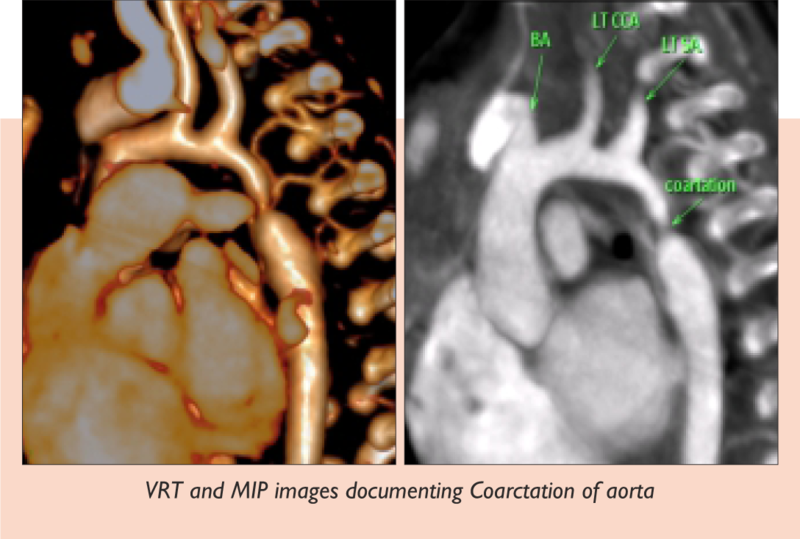 • 128-slice MDCT scanner offers better diagnostic interpretation and display of the entire aorta non-invasively and at lowest radiation dose (iDose). In a 43 yr old man with acute non-hemorrhagic infarct involving the right lentiform and right temporal and parietal lobes on the recent plain CT brain scan. 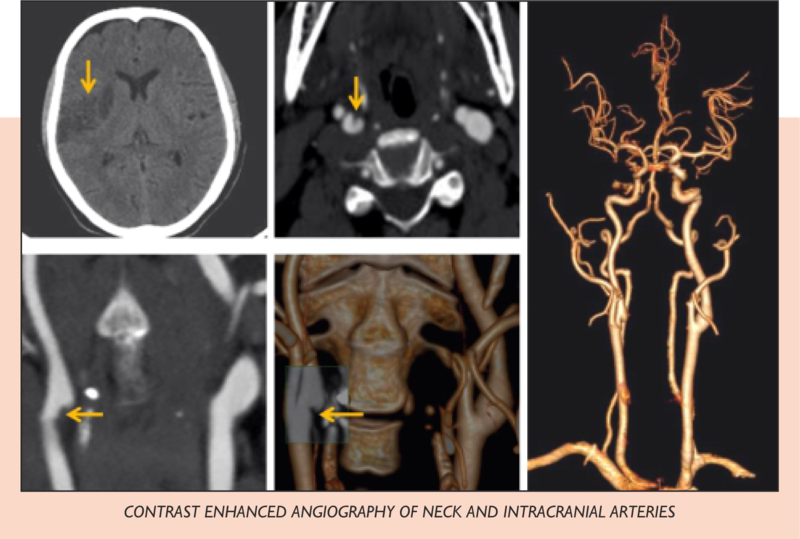 He underwent contrast enhanced CT angiography of the neck and intracranial arteries. • Plain CT brain images show acute non-hemorrhagic infarct in the right lentiform and right temporal and parietal lobes (a). 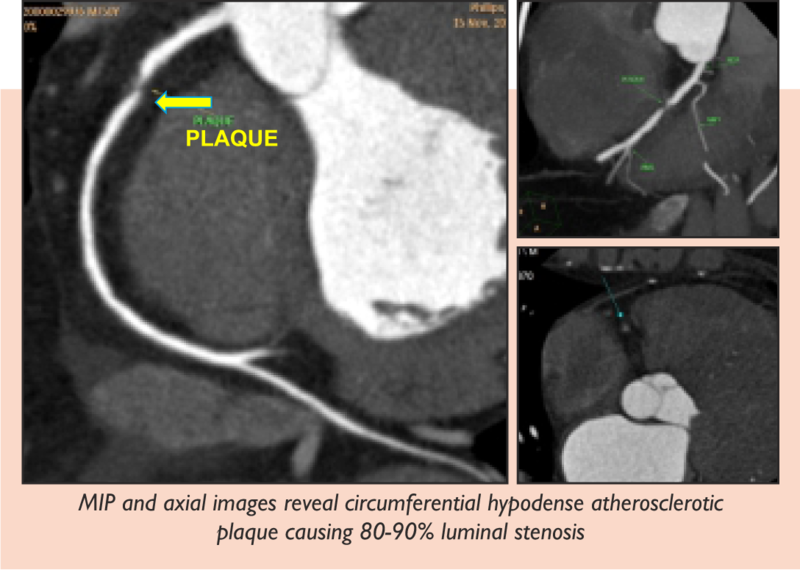 • The axial and coronal MIP (b, c) and volume rendered (VRT) images (d, e): reveal a non-calcific atherosclerotic plaque (arrows) at the right carotid bifurcation extending into right proximal internal carotid artery (ICA), causing mild (about 30%) luminal stenosis. One of the key diagnostic elements guiding the therapeutic approach in the acute phase of an ischemic stroke is the presence or absence of intracranial large vessel occlusion (LVO). 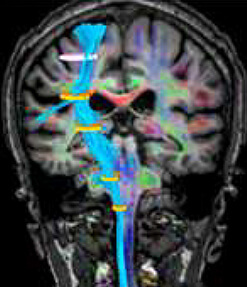 This can be detected using neurovascular CTA of the head and neck. A 50 yr old woman camewith complaints of pain onthe left side of abdomen. In staging renal cell carcinoma, the goal of any imaging study is to identify patients who have a respectable tumour and can be cured by means of surgical intervention. 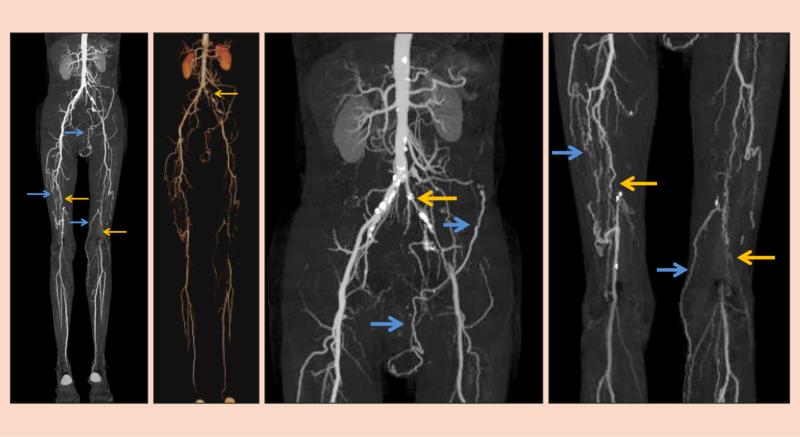 Three-dimensional CT combined with CT angiography has the potential to provide all the critical information needed to characterise the lesion and plan the surgical procedure. Our 128-slice CT scanner provides pre-operative interactive display of a 3D model of the affected kidney and its vascular supply to the surgeons. Tingling and numbness in right upper limb. Mild discolouration of little finger. 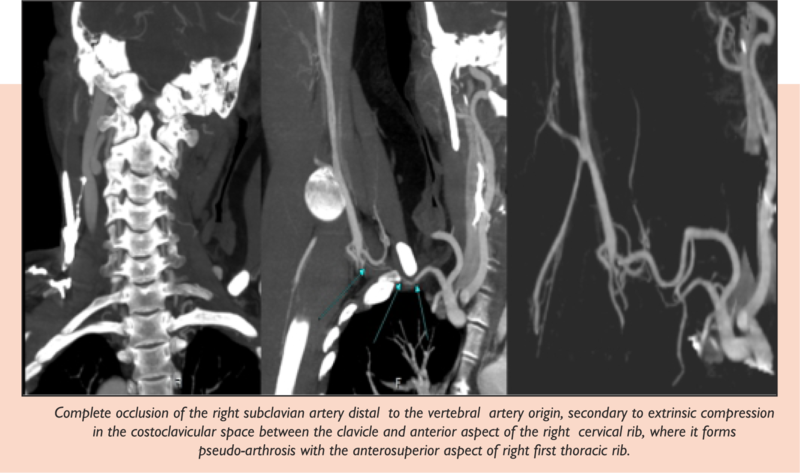 Subclavian angiography study is performed with the arm in overhead abduction. A 55 yr old patient with h/o peripheral arterial disease (PAD) and complaints of left lower limb claudication with ulcer. 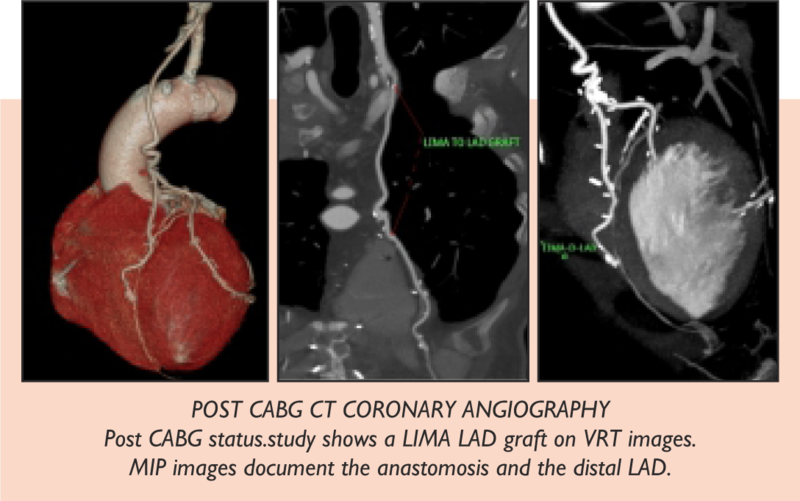 Long segment intra-luminal filling defect, suggesting thrombotic occlusion of the left CIA and EIA, just distal to aortic bifurcation ( ). • Distal-most EIA is reformed via multiple collaterals ( ). Arising from deep circumflex iliac, inferior epigastric-internal mammary pathway, superior rectal artery and lumbar arteries. • Distal SFA and proximal and mid popliteal artery show long segment thrombotic occlusion, on the left side ( ). Distal left popliteal artery is reformed via collaterals ( ). 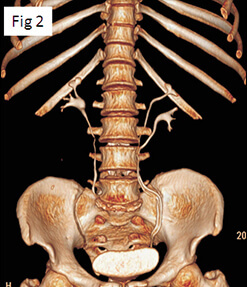 • Long segment thrombotic occlusion of right distal SFA ( ). Circumferential calcified plaque at SFA popliteal junction. Right popliteal artery reformed through collaterals ( ). 2D echo suggestive of pulmonary hypertension. Cyanotic spells. 2D echo suggestive of right ventricular outflow tract obstruction, large VSD and overriding of the aorta. 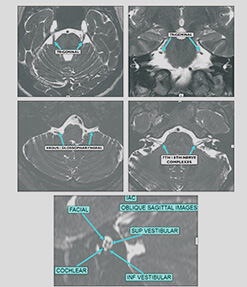 Two post-operative cases showing RV-PA conduit and bilateral BT shunts are also documented. Differential pulse and blood pressure measurements. 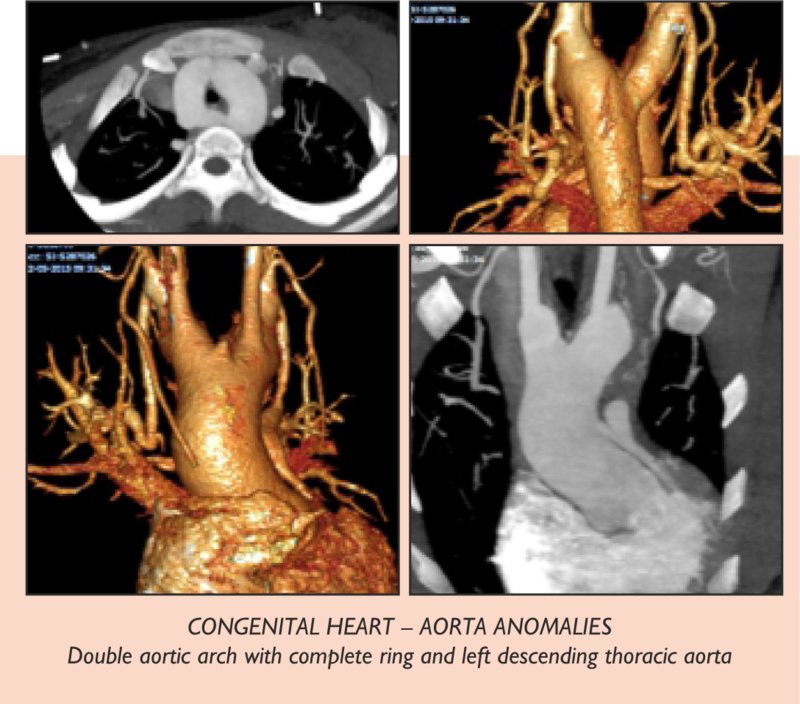 CT angiography is important in the evaluation of pediatric congenital heart disease. 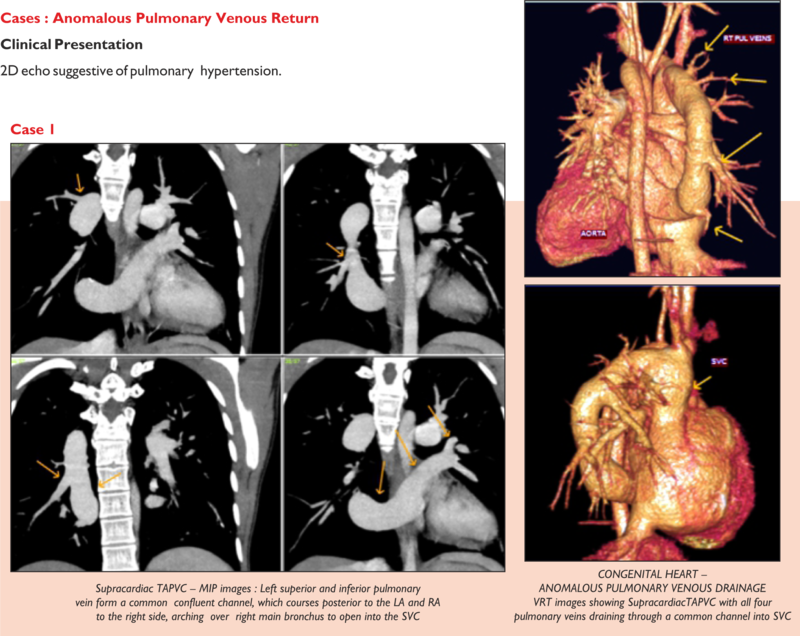 It can be used for accurate depiction of complex cardiovascular anatomic features both before and after surgery.Evaluation of post treatment complications can also be performed. 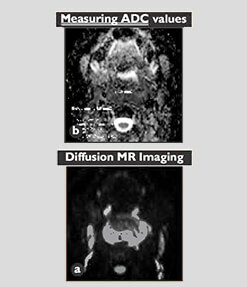 Compared with the previous CT scan machines, 128 slice scanner yields images with better temporal and spatial resolution, greater anatomic coverage of the patient, more consistent enhancement with lesser volume of intravascular contrast material and high quality 2D reformation and 3-D reconstruction owing to acquisition of an isotropic data set. 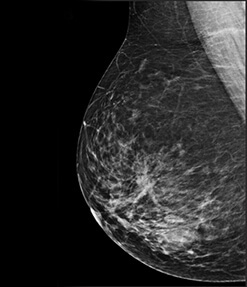 These are achieved with an additional advantage of reduced radiation dose to patient. 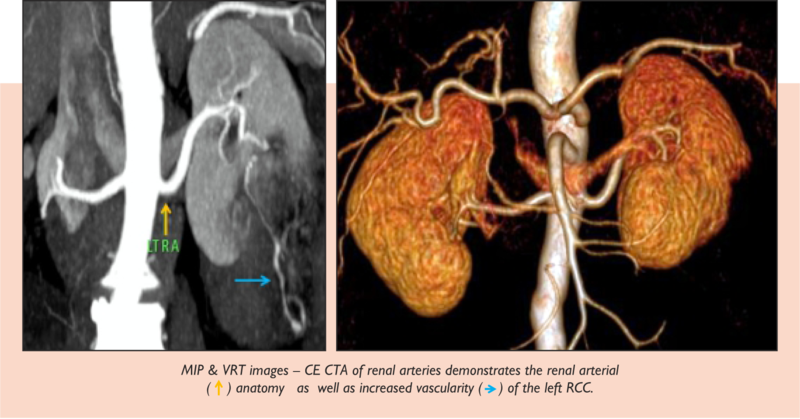 CT can be considered the first line imaging technique for evaluation of suspected vascular ring or sling, mapping of the aortopulmonary collateral arteries in patients with severe right ventricular outflow tract obstruction and evaluation of an anomalous pulmonary and systemic venous return. 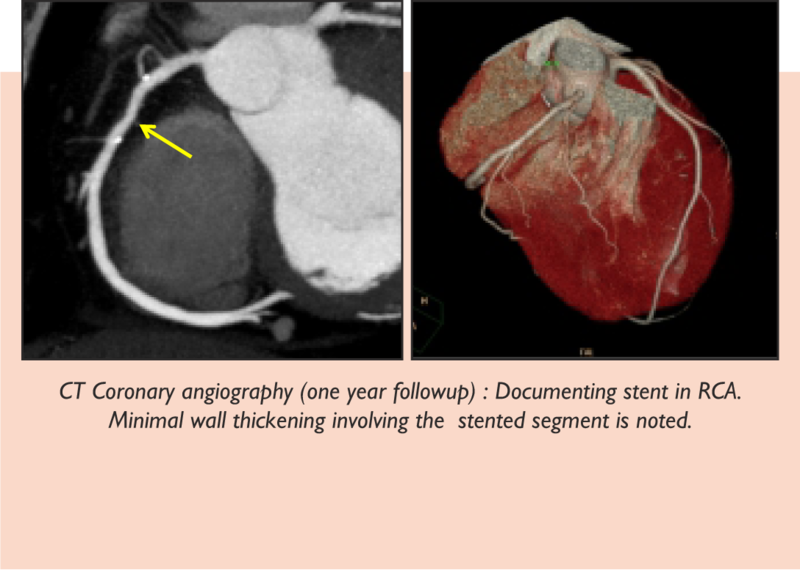 CT coronary angiography was performed followed byDSA and stenting. Chest pain with positive stress test results.